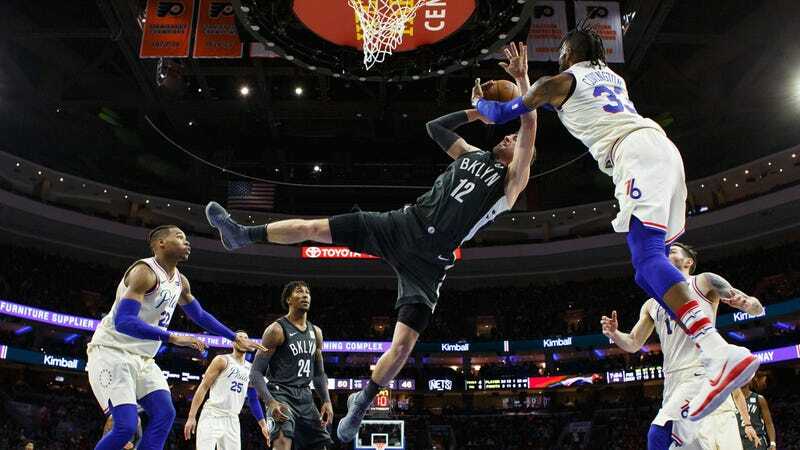 The Sixers’ Robert Covington blocks the Nets’ Joe Harris during last night’s game. The Sixers do not have Joel Embiid for the foreseeable future. He’s out after surgery for a fractured orbital bone. So far, that has not mattered. Philly won its 11th straight on Tuesday night, a 121-95 victory over the Nets. It’s the first time the Sixers have won 11 straight since 1990—so long ago that Mike Gminski was on the team. Last night’s game was actually pretty close for most of the first half. The Nets stink, and so their strategy was to just take a bunch of threes (18 of their first 23 shots) and hope they dropped. It worked for a while! They were down two with three minutes left in the first. The Sixers pulled away, and pretty quickly at that—they were up 12 at halftime and 20 just three minutes into the third. The rest of the game was basically garbage time. The Sixers led by as many as 30. But the way the game ended was pretty funny: The Nets’ Spencer Dinwiddie hit a three from near half court with 11 seconds left. Then... the teams just stood around as the Sixers victory song played and the clock ran out. 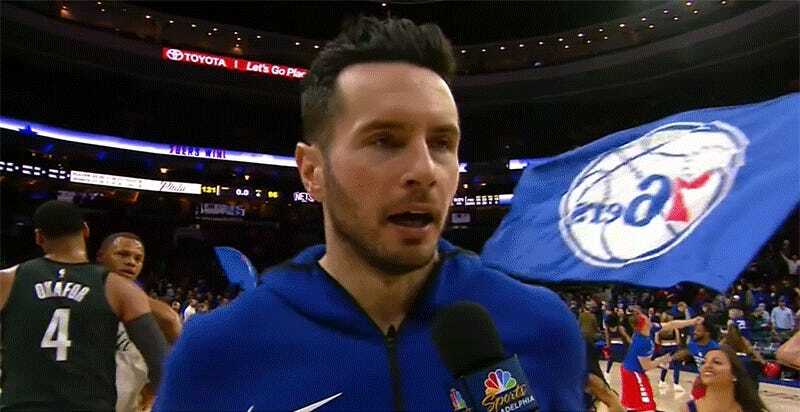 Bringing back “Here Come The Sixers” is the one lasting contribution from the era of former Sixers CEO and noted goofball Adam Aron. It’s a great tune, and the Sixers play it when they win. As the Sixers have started to blow out teams, the staff at the South Philly arena has been pushing the button a little early. But last night was great: The song played with 11 seconds left in the game! What if the Nets got a 30-point play? It was great. It was not the only funny thing at the Sixers last night. Ex-Sixers forward Jahlil Okafor scored a whopping 15 garbage time points for the Nets, and greeted his old mates after the game ends. And, as you can see in the corner of this GIF, he also reunited with Sixers dog mascot Franklin. Two Sixers legends, Okafor and Franklin, reunited. Philly is now 47-30, and racing toward 50 wins and home court advantage in the first round. Who knows how they’ll do in the playoffs, especially with Embiid a question mark. But for now, things in Philly are so fun they can play the victory song as early as they want to.